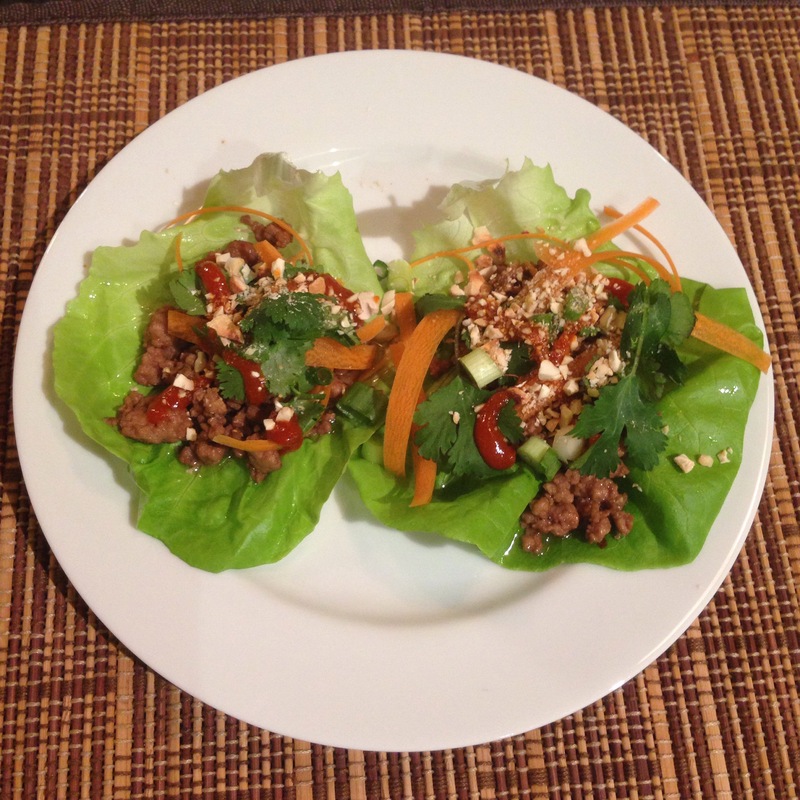 Countless variations of Asian-themed lettuce wraps exist. I created this recipe based on ingredients already in my kitchen along with a few others for which I shopped. This dish is light, low-carb, and paleo. If pork is not your thing, try ground chicken or tofu crumbles instead. Other fresh ingredients are possible as additions or substitutions. This dish can be a satisfying dinner or an appetizer. Leftovers make a delicious salad that you can take to work the next day. Prepare all ingredients before you being cooking. Thoroughly rinse, spin, and drain Bibb lettuce inside a salad spinner and place in refrigerator at least one hour before you plan to serve your wraps to ensure a crispy crunch. Heat oil in a wok or other deep non-stick skillet. Add garlic, ginger and crushed red pepper. Stir for 1-2 minutes until garlic begins to turn golden brown. Remove from heat. Stir in dark sesame oil. Plate Bibb lettuce leaves. Spoon equal amounts of ground pork onto each leaf. Add shaved carrots, cilantro, scallions and about 1/2 tsp of cashews per wrap. Add Srirachi to taste. Iron 13 %. Calculated from MyFitnessPal.